You can use either 3/4 inch plywood, 2x8's, or 2x6's to build the forms for the concrete stairs. The rise and run of the stairs will determine which material is best to use. The rise and run of the stairs will determine which material is best to use. Keep concrete damp for a period of 5 to 7 days after it has been poured. This helps the hardening (hydrating) process, thus producing a more durable surface. After concrete has cured remove forms. This helps the hardening (hydrating) process, thus producing a more durable surface. Prior to placing concrete forms: Construct the form with 2x4 or 2x6 lumber and secure in place by wood stakes and deck screws. Excavate the slab area to a depth of about 7 inches, allowing 3 inches for a gravel base and 4 inches for concrete. 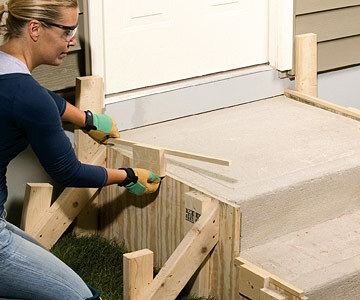 This video will guide you to build up your own concrete stairs. Steps shown in this video comprise of laying out the size, arranging the sub-base, developing the forms, pouring, finishing and curing the concrete from starting to completion.